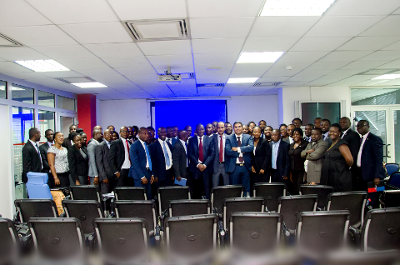 SAHEL-SAHARA BANK (BSIC GHANA LTD.) LAUNCHES THE “GENESIS PROJECT”- AMPLITUDE IMPLEMENTATION. Sahel-Sahara Bank (BSIC Ghana Ltd.) has formally launched the implementation of Amplitude Banking Application (Dubbed, ‘’Genesis Project’’) on Saturday 31st October, 2015. The Bank’s decision to change its current banking application from Smart Bank to the Amplitude Banking Application is to deliver excellent customer service. This new platform is critical to the bank’s operations due to its unique value proposition. At the launch, Managing Director of the Bank, Mr. Adama Diop explained that even though the new banking software is more of IT infrastructure, its implementation and ultimate usage is for all departments in the Bank. He therefore challenged all staff to embrace the new software and get fully involved in its implementation. With regard to the main purpose of the Amplitude Banking Application, the Managing Director intimated that this new software application is user-friendly, very flexible and after its implementation, all bottlenecks in the area of customer service delivery will be a thing of the past. He reiterated that the industry is moving towards technology that will invariably inure to positive customer experience in relation to speed, efficiency and excellent relationship management. “BSIC Group therefore needs to adopt and follow the global trend as part of the Groups overall growth strategy”, he noted. Deputy Project Manager of Bsic Group, Mr. Djibril Ben –Aya emphasized that key among reasons for the selection of Amplitude is improvement in customer relationship management and the flexibility of usage that Amplitude provides, as compared to other banking applications.